This afternoon, a site called Razorianfly posted a very interesting tidbit of information along with a purported screenshot to back it up. According to the site, Tweetie 2.0 for Mac is launching tomorrow alongside the Mac App Store. Update: Confirmed: Tweetie 2 (Twitter) for Mac Is Coming! If true, this is big news for Mac users who have long feared that the beloved app had been left for dead since Twitter acquired Tweetie and its developer, Loren Brichter, back in April of last year. That acquisition included both the iPhone and Mac versions of the software. But while Tweetie for iPhone was relatively quickly turned into Twitter for iPhone, Tweetie for Mac has only seen minimal bug fixes. Meanwhile, Brichter was hard at work on Twitter for iPad. So is it coming? Well, the normally chatty Twitter PR team seems oddly silent at the moment. Has the company in Cupertino told the startup to ignore all questions about the product? Perhaps. At that time, Brichter was being coy on Twitter as to the future of the product. And while Twitter said they weren’t “actively planning” a release, the word from MacHeist director John Casasanta was that Brichter was in fact actively working on it — it was just coming along slowly. Casasanta was in a unique position to know about it because he had promised a pre-release build of Tweetie 2 for Mac for people who bought the MacHeist bundle last year. But that was before the Twitter deal went down. 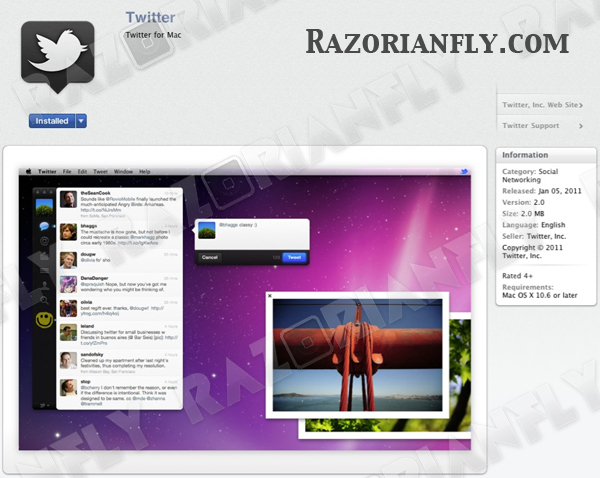 So could Twitter have ramped up development of Tweetie for Mac over the past 2 months? It’s certainly possible. The last big project, New Twitter, was completed in September. And Apple announced the Mac App Store on October 20. Apple may have reached out to the company to see if they could launch the app alongside the new store — which again, will be tomorrow. We had heard that Apple previously approached Twitter about having a Safari extension ready to go for that launch as well. As for the screenshot, the images of the various users are all Twitter employees. And the two icons attached to the account loaded on the app are both controlled by Brichter. The file size (2.0 MB) also seems to match up well with that of the current Tweetie for Mac. Of course, all of that could be faked by a person who knows what they’re doing. But it’s also worth noting that Twitter does use that dark icon for test software. When it goes live, the icon becomes Twitter blue. So yes, this could be an internal shot. Long story short, it’s still very much a “maybe” for tomorrow. But it’s an increasingly strong “maybe”.